I love the dotted chevron card I so need to get that set. great cards. Love the way you added the colored focal point on the first one. The second one is so strking. did you clear or white emboss before coloring? I love how you used all of the stamps for the background. Great cards Kristie! I especially LOVE the second one - awesome!! Oh, WOW, Kristie! Look at how those colors POP!!! These are both absolutely fantastic! I cannot thank you enough for being a part of this special blog hop today! Thank you! What a way to bring a smile to a friends face with the first card. It just sings "happy, happy, hello" and the second card is beautiful and makes you feel pretty just looking at it. Love them both! As usual - totally gorgeous cards! Pretty cards Kristie. Love the colors and design. Happy World Card Making Day and have a great weekend. Fabulous colors on both cards!! Both cards are beautiful and striking. 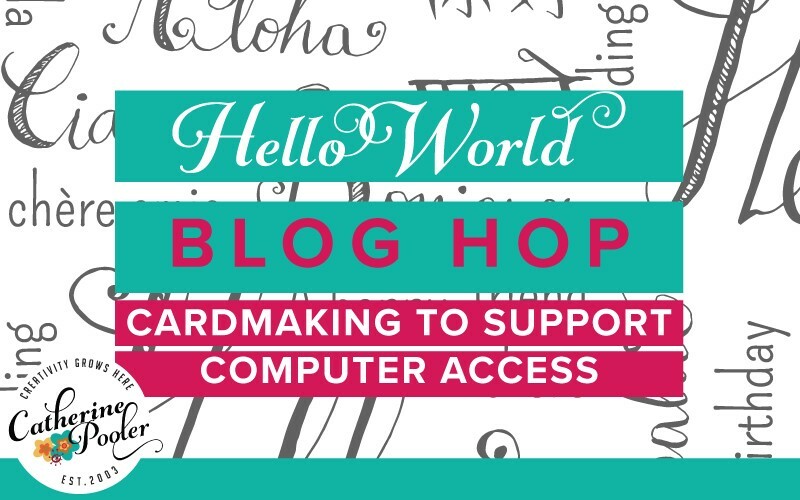 I'm honored to be a part of this blog hop with you, Kristie! I love your use of big bold colors!! Both examples just made me smile! Both of these cards are absolutely beautiful. Your cards are stunning! Love the dot one! 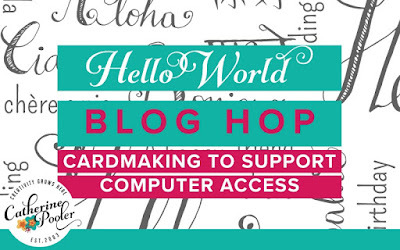 Yay for teachers, and for all of you fabulously talented cardmaker's who give so freely! LOve your style, girlfriend!! Nice touches on the cards! WOW! Love the colors and the use of the stamps to create the background! Love the dotted chevron. I've already ordered that set. Such a good cause. I'm loving the dotted chevron card, tho I would change the color. Oh my! Two super fantabulous cards! Beautiful backgrounds, these are fantastic! I love the Hello World set and ordered it! I love that I am able to be a part of helping kids get the tools they need to succeed! Your cards are awesome!! Especially the second one~ *sigh* totally beautiful! TFS! I really like both your cards. Both are simple, colorful and fun. What a great combination. Loving the poke-a-dot chevron....so fun! I loved the beautiful bright colors of both cards! So pretty! Thanks for participating in the blog hop! LOVE LOVE the colorful IMPACT your cards always have!!!! I love your colorful Hello card! It's so fun and cheerful and as an educator myself, I am so thrilled to see what a really great organization all this is going to! Amazing! Both great cards kristie! Love your colorful background with all the hellos! The colours are gorgeous! The card with the polk-a-dots is my favourite. ways to say Hello is fun. As always Kristie awesome cards. I love them! Kristie, love them both! The masking on the first one is perfect and super pretty colors on the 2nd one! I love, love, love the pop of color on the first one and the stunning ombre on the second one! Amazingly wonderful cards!!!!! Both cards are so cute and unexpected! I love the bright ombre backgrounds!! Love both your cards. They are amazing, it is a great cause. I love both of your cards, but the second one is fabulous! I think the dotted chevron is amazing! And such a great cause! Thanks for sharing your creativity! Both cards are great - I love the masking on the first. The added enamel dots on the bottom of the second card are the perfect touch! Lovely card. I love your background. Both cards are simply beautiful!